In stock -This product will ship today if ordered within the next 17 minutes. 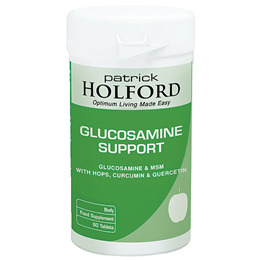 Patrick Holford Glucosamine Support is a potent combination of amino acids and botanicals to support healthy joints. Glucosamine hydrochloride and MSM provide structural support to the joints, whilst MSM combines with hops, olive extract, curcumin and quercetin to maintain healthy joint tissue status. Olive Extract provides Hydroxytyrosol and is a potent free radical quencher with over 10 times the power of vitamin C.
Glucosamine Hydrochloride (Crustaceans), Bulking Agent (microcrystalline cellulose), Curcumin, (Curcuma longa root), Methylsulphonylmethane, Hops Extract (Humulus lupulus seed), Dicalcium phosphate, Quercetin, Anti-caking Agents (Magnesium Stearate and Silicon Dioxide), Tablet Coating (hydroxypropyl methylcellulose). Two tablets taken daily with food, or two tablets three times daily if required or as professionally directed. Below are reviews of Glucosamine Support - Glucosamine & MSM - 60 Tablets by bodykind customers. If you have tried this product we'd love to hear what you think so please leave a review. 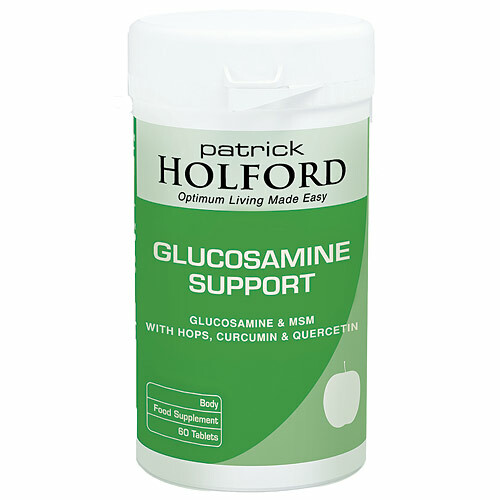 Patrick Holford Glucosamine Support is a potent combination of amino acids and botanicals to support healthy joints. Glucosamine hydrochloride and MSM provide structural support to the joints.